Our recent article comparing the new Panasonic Lumix LX5 and Canon Powershot S95 high end cameras has resulted in us getting a fair bit of email, so we thought we’d post a follow up article answering some of the points raised. At the end of the day, these are all “happy-snappy” cameras. i.e., you can’t take them too seriously – despite the heavy price tags. The results are going to be pretty marginal in comparison. The Canon does sport RAW format which is a big plus though. We disagree. The Lumix LX5 also supports RAW and both cameras are far from ‘happy snappy’ cameras – in the right hands, they’re extremely versatile tools capable of very high quality results – check out the Lumix LX3 and Canon S90 photo pools for examples of what their predecessors could achieve . We’ve sold numerous photos taken on our long-serving Lumix LX3, and it’s proved a reliable and durable performer – in fact, when reviewing some of our photos we weren’t able to immediately tell if some were taken on our Nikon D300 dSLR or the LX3 without indulging in a bout of pixel-peeping. That said, Nick is right to say that the difference in output from both the new Canon and the Lumix cameras will be marginal: with the two cameras packing similar, high quality components you’ll be unlikely to see any huge advantage either way. What I have not read yet, is a really valid comment on exactly how pocketable the LX5 is. I know the S95 is, and I see the LX5 noted as ‘slightly larger’. I would like to know, and I realize I might have to wait til I handle one, is whether the LX5 is shirt pocketable. Here’s where the Canon scores points over the Lumix, with its slightly smaller dimensions making the difference between a truly pocketable camera (albeit with big pockets) and something you’d probably prefer to carry with a strap. You could probably wedge a Lumix LX5 into the pockets of ‘cargo’ style pants, but we’ve always carried the LX3 by it’s strap – something that offers the advantage of being able to access it quicker, but at the cost of being less discrete. The LX5 is slightly larger overall, but appears to be – crucially for wedging it into pockets! – a little bit slimmer (25mm compared to the LX3′s 27mm). Same size as the GF-1? 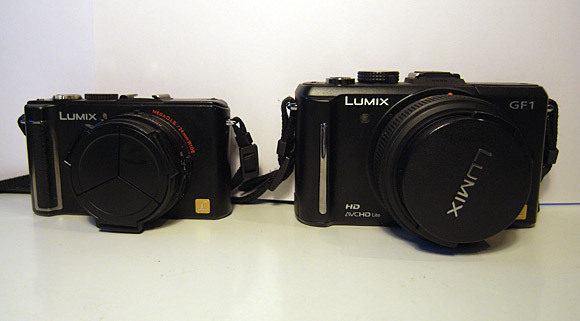 There’s actually a substantial difference in size between the two – here’s two rather hastily taken comparison photos of our Lumix GF-1 and LX3 cameras, showing the GF-1 dwarfing the LX3 (note that we’ve added the excellent Ricoh ‘exploding’ lens cap to our LX3, which adds a few mm). Considering the given specs which is the best to use during concerts or similar situations? We’d say that it very much depends on what kind of gigs you’re looking to snap. Neither camera would be much good for big theatre gigs because of the lack of a long, fast zoom and the cameras’ small sensor size, but if you’re able to get close up and personal at smaller gigs, the LX5’s wider angle lens may prove persuasive. The photo below was taken on our Lumix LX3 at the recent Vintage at Goodwood festival. Here’s a tip for you too: if you’re bringing a camera into a gig where they they’re not allowing ‘professional’ cameras in – and both these cameras may fall foul of this rule if the bouncers are bring stroppy – stick some white tape around your camera to make it look like it’s on its a crap cheap snapper on its last legs, and you might just get away with it. It’s worked for us a few times! Again, the Canon S95 would be our choice if were looking to do a lot of small concert photography because of its smaller dimensions – but the 28mm wide angle may seem restrictive if you’re looking to take photos in cramped clubs. 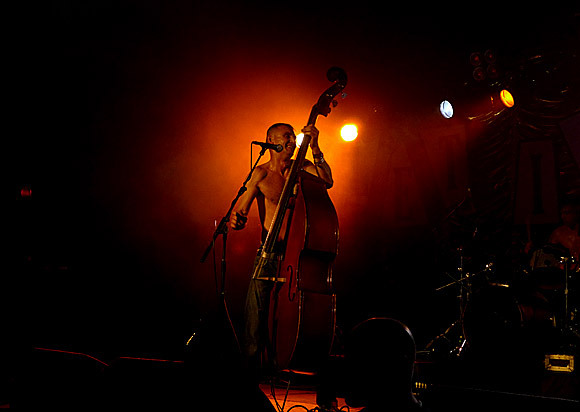 Of course, in low light the difference between the sensor size becomes far more apparent, and a good dSLR will always outperform even a high quality compact when the light gets low – if you’re serious about band photography, get a dSLR. The inability of compacts to offer real depth of field for portraits can also prove frustrating in some circumstances, but as general, carry-everywhere cameras, both the Lumix and Powershot can produce good results for even large prints. The old adage goes that the best camera to have is the one that you are carrying at the time, and that’s something we agree with. An advanced dSLR may give you better results, but if it’s sat at home because you’re finding it too heavy/risky to lug about, then it’s easy to justify the expense of shelling out for a decent compact. We’ve tested a lot of high end compacts, and for us the LX3 remains the best we’ve tested so far, although the S90 ran it a very close second, with Ricoh’s GX200 not far behind (although an excellent performer, the Canon G11 is simply too bulky for us to consider). We’re looking forward to testing the new Canon and Lumix cameras and will report back our findings – and if you manage to get your hands on one before us, we’d love to hear your opinions! Oh, and thanks again for your input – we’re looking to buy one of these cameras too, so it’s helping us decide! Canon PowerShot S95 – Panasonic Lumix LX5. I think the article is rather pointless, since it does not really compare LX5 and S95. Instead, it seems to focus so much more on LX3. Without actually comparing LX5 and S95 in hand, these kind of comparisons are useless and easily mislead readers. JKim: the LX5 shares many of the characteristics of the LX3, as does the S95 to the S90. Seeing as neither camera has been released yet, all we can go on is the released specs and our experiences with the previous models. We certainly have no intention of misleading anyone – we’re really excited about both cameras and just want to discuss what we feel might prove to be the important differences. I’ve really enjoyed your two articles about these two cameras. I’m in much the same situation, trying to weigh up which one looks the best, and your comments have been a great help. Although I like the smaller size of the Canon, I’m being persuaded by what you said about the wider 24mm lens – my current camera has a 28mm lens and I’d love to be able to get a wider view! The size specs are also misleading. Panasonic lists the camera’s depth without taking the lens into consideration, which makes it quite a bit thicker than the advertised 25mm. Canon’s S90 specs show it to be thicker, yet it is not even close to being as bulky as the LX3/LX5. Yes, you’re right. We’ve said all along that the Canon is more pocketable than the Lumix whatever the specs say, but biggest consideration for us is the trade-off of the far wider 24mm lens of the Lumix versus the more compact dimensions of the S95. For us, the inconvenience of the larger body is worth it because once you get used to a 24mm lens, anything less feels very restrictive, but others may prefer a smaller camera. If only the S95 offered a 24mm lens and we would have been sold! Has the new Canon 95 got the old fault of Canon cameras, namely,yellow colour bias and the dreaded cyan skies? If so, that alone would put the Panasonic ahead. Your dimensions for the S95, LX3, and the LX5 are wrong as it doesn’t include the lens projection. The S95 is 30 mm deep across the lens, and the LX5 is 43 mm; but that does not include the cap. I do not have an accurate dimension for the LX3; but it has to be similar to the LX5. 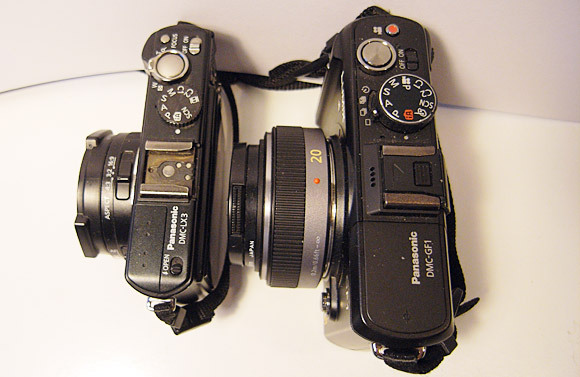 Since the depth has a major effect on pocketability; not having these dimensions correct is misleading and a disservice to your readers, although the photo of the LX3 and GF1 clearly shows the lens projection of the LX3. As to 24 mm Vs 28 mm for wide angle, I am not a big fan of wider angle lenses. Just my preference after decades of experience. Comment to E. Cooper. I usually associate the cyan skies with earlier Panasonic cameras. All my Canon’s have produced good looking blues in the sky. The “Canon color” has been one of the reasons I’ve had mostly Canon’s since going digital. Gerard – thanks for your feedback. Irrespective of the dimensions given out by the manufacturers, we’ve repeatedly stated that the Canon is a lot more pocketable than the Lumix – the S95 can just about be slipped into largeish pockets, while you’re going to need MC Hammer’s pants for the Lumix. The LX3/LX5 is really a camera that needs to be carried by an over the shoulder strap, although some may find the the greater physical size improves handling. You won’t make us budge on the 24mm lens though – it’s proved a real advantage over the years! OK, could you please put the “dimensions” test to bed for us? Presuming you still have the LX5….. The LX3 was just about exactly two inches “thick” at the lens cap. It’s that “thickness” that makes it so difficult to get into your pocket — heck, the enormous G11 isn’t that thick, and will actually go into a pocket that much easier. So, given how we can’t trust an Panasonic dimension measurement — just how thick is the LX5 at the lens cap? The LX3 is approx 45mm deep when the lens is taken to account. If size is so important (and I still have reservations about “Canon colours”) why not look away from the S95 at the new Canon Ixus 300 HS. Great f2 lens, 28-105mm, genuine AS and TS, state of the art backlit sensor, 3cm macro, lovely grippy matt black stainless steel body, and slips into the pocket like a bar of soap at 175 gram. Lets face it, these are all compacts and you won’t get any world-class landscapes or macros on any of them them, but with a really pocket-sized lowlight rocket like the Ixus, doing a Cartier-Bresson is entirely possible. And it’s come down from £379 to £250 street price. Why there are not images to compare ? The most import factor is the quality of the images. Hannah: both the cameras hadn’t been released in the UK when the article was written. It’s got a smaller sensor, though — one of the best things about the S90 is the IQ (given its size). I have a particular need for a pocket camera that does really well on close focussing and I’ve been pointed in the direction of these two cameras. Any views on close focus capabilities would be appreciated. I actually would prefer more zoom on the telephoto side. 28 is decently wide (way more than the more normal 35mm on a lot of earlier point n shoots). More importantly, I find that too wide an angle is an annoyance when taking quick snapshots of people. Since these cameras boot up at the wide end of the zoom range, I either deal with the distortion or waste time having to zoom the lens in closer before snapping the shot. Jon: you can turn on step zoom on the LX5, so you can quickly jump to 24mm, 28mm, 35mm, 50mm, 70mm and 90mm settings. Jon, exactly this is what I appreciated much on my S90 – it really has a memory and even after shut down completely it will “open” during next start-up on the same zoom that was lastly set on!!! What’s more, it acts like this, only if you used for the setting of the zoom the exact incremental steps (28mm, 35mm,50mm..etc) through that fantastic lens ring. So as soon as I slightly changed the zoom manually from any of these exact positions with the zoom lever, then this “memory” was “erased” and next time the S90 opened at common 28mm!!! So you can in fact choose out of both methods – with or without “zoom resume” in a very simple way of use, just operating control ring or zoom lever according to your momental situation and wishes!!! By the way guys, many thanks for your excellent comparison article! I myself am going for S95, as for me its pocketability is crutial! My friend is supposed tu buy my “5-months old” S90 so I’m incredibly happy to get S95, which must surely be absolutely thorough and perfect, as alreday the S90 was, so any improvement will be even as a topping on a tart! By the way, I consider it as deeply incorrect from Panasonic to state 25mm depth on something which is in reality 43mm!!! For me it is simply an unfair behaviour against competitors and this is a significant signal for my final choice too! Also this is unforgivable to dpreview.com that they accept this measures in their tech.parameters data and then you get absolutely misleading results in their (on the other hand fantastic!) “side by side comparisons” charts. There is nothing to speak about the size comparison between S90 and LX3 in my opinion. And the difference must be even higher between S95 and LX5, as they both went in the opposit size directions! Now, when looking closer to that picture, I’m afraid Panasonic even didn’t include the LCD screen protrusion into those 25mm!? Could some of owners confirm? Peter: There’s no denying that the LX5 is bigger than the S95, but then the LX5 offers more hands on controls and a much wider zoom. All compact cameras are a compromise, so it’s really down to personal preference. Seeing as Canon still won’t send us a S95 for review, please post up your opinions! I think I am going for the Canon S95 as a DSLR replacement. I need something pocketable. No, it was taken with the LX3 – the LX5 wasn’t out yet. I used the LX3 camera to illustrate the fact that you can take good concert photos with small cameras like the LX3/5 and how useful the 24mm wideangle can be. LX5 can zoom during video shot but S95 can’t. LX5 got better lens than S95. In term of pocketable S95 is the winner. S95 can shoot stereo sound in video mode. S95 can now zoom and focus with the CHDK hack that can install at camera bootup. However zoom motor sounds can be heard in S95. But S95 video is much improved with CHDK hack. The S95 can only rave about its smaller size and stereo sound during video. But it looks like the LX5 is overall a better camera than S95 for picture images. I think s95 easily fits in any pocket, great photos in day and low light and battery lasts longer than expected. Having looked at photos on Flickr – LX3 images do have better quality & appeal. The S95 takes flawless shots but they seem a little flat & uninteresting for some reason.